Bee's Knees Lacquer "Bogeys, Bogles, & Bargs" is a wine polish with pink to yellow and teal to green aurora shimmer, filled with scattered holo and holo microflakes. When I applied this I thought it was a steel gray base and was so surprised to look at my photos and see how purple it is! I love how packed it is with shimmer and flakes. The formula is pretty good and smooth but I did have a couple flakes sticking up that I had to go back and fix. Shown is two coats plus coat. Dollish Polish "Enchanted Fairy" is a periwinkle with blue/violet shimmer, with turquoise, green and purple micro flakes & shreds. I really love the shimmer of micro flakes against the base! The shreds are large enough that you want to apply with care but the formula is still easy to work with. Shown is two coats plus coat. 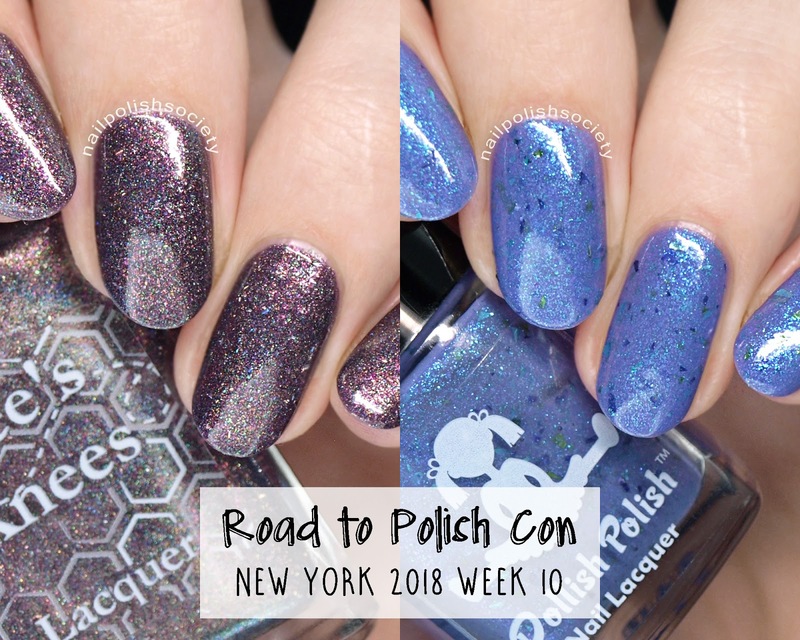 The Week 10 polishes will be available for one week only- Sunday May 20th through Saturday May 26th. Shipping is a flat rate of $3.50 for Domestic orders and $11.00 for International orders. If you plan on Holding Shipment until the end, use code FREESHIP which will remove your weekly shipping charge. You will be invoiced for an accurate shipping price at the end of week 11 and orders will ship once invoice is paid.